The 2nd Class Ribbon was worn either on a bar above the left breast pocket, but more commonly and by German tradition was worn though the hole of the second button down from the top of the uniform. 1st Class Iron Crosses were worn on the left breast pocket and never were issued with a ribbon. 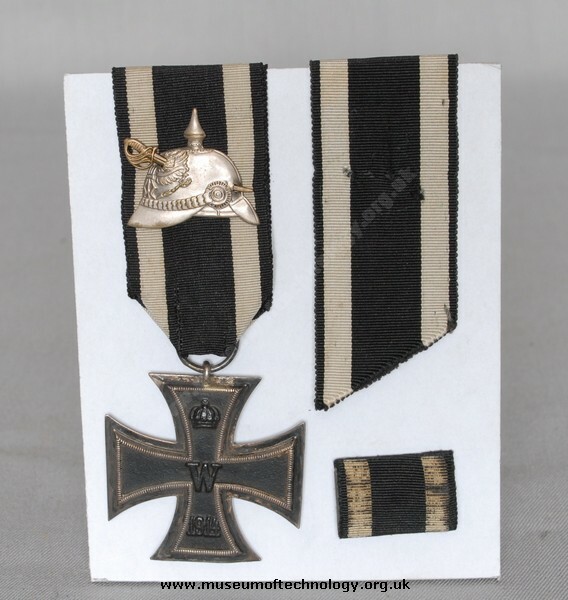 Knights cross of the Iron Cross were worn at the neck by a larger version of the second class award ribbon. World War One ribbon was Black and White, World War 2 ribbon was Black and white, with a wide red stripe replacing the black one. The awards were unnamed, but a certificate was given when the award was notified, being more elaborate in line with the category of award.